Pollack excels by establishing an interesting situation, sustaining it, and—in keeping with the paranoid-thriller genre—resolving it on a pleasingly ambiguous note. 118 min. Paramount Pictures. Director: Sydney Pollack. Cast: Robert Redford, Faye Dunaway, Cliff Robertson, Max von Sydow, John Houseman. 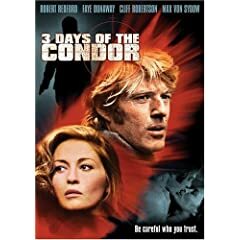 James Grady's novel Six Days of the Condor, this Watergate-era paranoid thriller engages by ever so slowly doling out information. Semple and director Sidney Pollack accomplish this task so well that they don't need to slather the story in excessive style or overblown action. The film further benefits from the photography of Owen Roizman (The French Connection, The Exorcist, Network, Tootsie), shrewd leading performances by Robert Redford and Faye Dunaway, and supporting turns by Max von Sydow, Cliff Robertson, and John Houseman. The film's opening scenes introduce Redford's smart but dumb-lucky hero: CIA analyst Joe Turner (code name: Condor). When his NYC offices—which operate under the unassuming cover of American Literary Historical Society—come under attack, Turner finds himself on the run ("I'm not a field agent. I just read books!" he desperately tells a handler). Turner's superiors are hesistant in bringing him in from the cold, and when he comes under fire from mysterious assassins (including von Sydow's "Joubert"), Turner quickly determines that he can't trust anyone. In what turns out to be a smart move, Turner selects, at something close to random, a hostage: Dunaway's beautiful photographer Kathy Hale. The very randomness of their pairing ensures Turner that she's not a hostile agent, but then again, she's not exactly endeared to her captor, either. At least not at first: before long, a forced intimacy (expertly framed by Pollack) causes sparks to fly between the attractive duo, despite her ineligibility. Turner's analytical skills help him to size up and bed Kate in an artily edited love scene. Even in 1975, with the Cold War still dragging onward, Three Days of the Condor saw the wave of the future for espionage, and espionage thrillers. In one of the film's best scenes, Turner's superior—NY Deputy Director Higgins (Cliff Robertson)—commiserates with one of his own bosses, one Mr. Wabash (Houseman). Wabash talks of his service in WWII, then notes, "I go even further back than that. Ten years after the Great War, as we used to call it. Before we knew enough to number them." "You miss that kind of action, sir?" Higgins asks. "No," Wabash replies. "I miss that kind of clarity." One could call Three Days of the Condor badly dated by its technology and fashion and Dave Grusin's jazz score (or, to be more charitable, noticeably dated), but better to acknowledge its time-capsule quality. Pollack excels by establishing an interesting situation, sustaining it, and—in keeping with the paranoid-thriller genre—resolving it on a pleasingly ambiguous note. 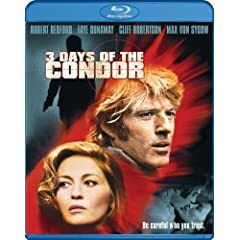 Though grain haters will choke on it, the picture on the Blu-ray disc of Three Days of the Condor takes a beautifully clean source print and turns it into a natural, gloriously film-like image. Detail is quite good—the only flaws come from the source, which fleetingly comes across as soft or partially out of focus (as in the credits sequence). Surprisingly, this 1975 film also gets the Dolby TrueHD 5.1 treatment, to surprisingly good effect. Though this isn't a film with a ton of action, when hell does break loose, the mix does a good job of putting us in the middle of it. Sadly, especially in light of Sydney Pollack's recent passing, there is only one paltry bonus feature on this disc, the film's "Theatrical Trailer" (3:04, HD). Still, this Blu-ray of a minor-classic catalog title is well worth picking up. All site content © 2000-2019 Peter Canavese. Page generated at 04/18/2019 02:39:55AM.